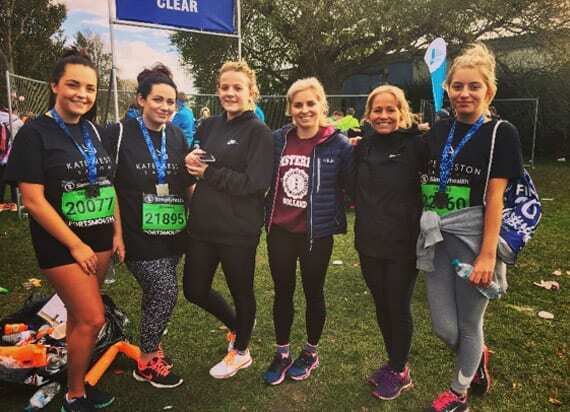 When we were told we could have the opportunity to run as a team for the Great South Run we were all very excited but nervous as we had never done anything like this before. We were all more excited about getting our ‘Kate Preston’ team T-shirts to wear and planning our outfits! However, we did have to start thinking about the training which we weren’t so keen on. Jaycee and I have never been into running and our family’s didn’t think we was even going to attempt it especially as the weather forecasted ‘Storm Brian’ with strong winds and heavy rain! We woke up on the morning of the race on the Sunday at 7am getting ourselves psyched up and arrived in Southsea to meet the rest of the team in the blowing wind it was freezing! 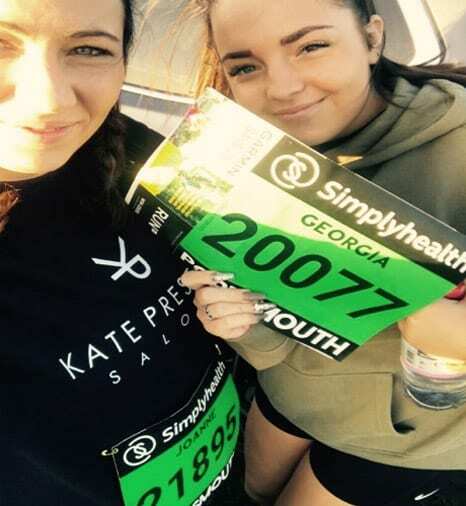 It was only when we had helped each other put our running numbers on and got ready for the race it that all started to feel real… Kate and Libby were in first wave so they left to get warmed up whilst we wished them good luck and grabbed ourselves a burger before our race! Everywhere was getting so busy by now with all the runners getting ready and the crowd getting behind the barriers to cheer everyone on. It was 10:50 and we had to get in our wave to start the warm up which was fun and a laugh. By this point the atmosphere was AMAZING! Before we knew it the gun went off which meant we had started so we all started running against the wind which was a struggle but before we knew it we were already at mile 2 which was by the HMS Victory and through Portsmouth Dockyard. We ended up losing each other in the crowd but carried on running with the rest of the team. We had said from the start that our aim was to finish with in 2 and a half hours. So we kept jogging and speed walking. The cheering from the crowd really kept you going I did think a few times that I really wanted to quit but I knew It wouldn’t be worth it. We got to about mile 5 and Jaycee caught us up! So we stuck together and paced ourselves. The feeling was amazing knowing that we were already half way there. We then got to mile 7 and our feet and legs were really starting the ache but we knew we couldn’t stop now there was no going back. We carried on motivating each other and when we spotted the sign for mile 9 it was such a relief and so exciting to think we were almost there! We kept each other going and by this point the crowd was giving us jelly babies to keep us going (We don’t even like jelly babies but were desperate for). The wind was against us so much in the last mile it felt like we were getting nowhere but we had spotted the 200 metre sign by the pyramids so we knew we were so close. It was the best feeling ever knowing we had finished in 2hours and 28minutes. The smiles on our faces were unbelievable we couldn’t believe that we had achieved it. I hobbled to get my medal and goodie bag whilst on the phone to my mum to tell her I made it and finished in one piece. I burst into happy tears.